My fellow colleague Bernhard developed two iOS Crackme and here is the writeup. 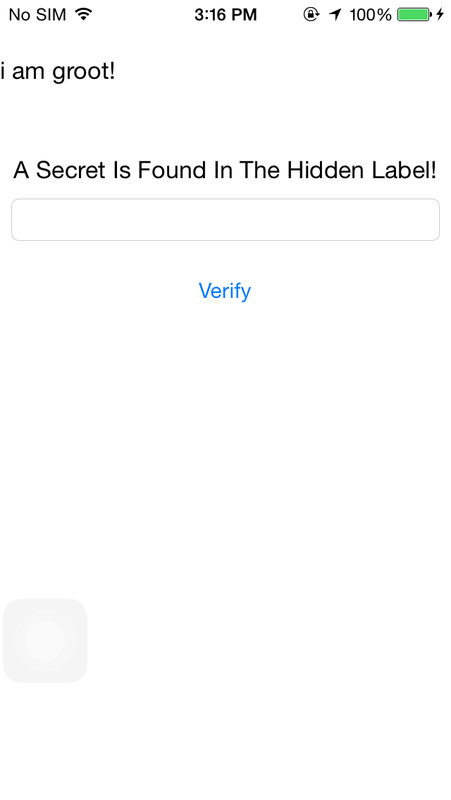 From the main view, it hints that the flag can be found in the hidden label. 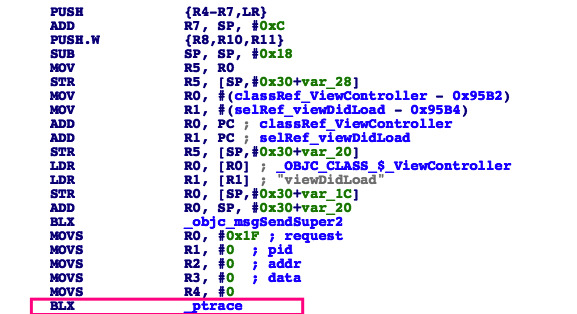 Well if that is not a red herring like every crackme challenge, lets try to unhidden the hidden label using cycript. Lets print the view hierarchy and locate the address for the hidden label. The command [[UIApp keyWindow] recursiveDescription].toString() returns the view hierarchy of keyWindow. The description of every subview and sub-subview of keyWindow will be shown and the indentation space reflects the relationships of each views. For an example UILabel, UITextField and UIButton are subviews of UIView. We can see that the UILabel 0x156a3b10 is hidden. And we have our flag :), lets move onto level 2. The second app has a number of security implementations, to identify those I did some minor reverse engineering. Let's start off with class-dump to identify what header class are used to get a glimpse of the application internal. drwxr-xr-x 17 tnayr staff  578 Apr 20 16:58 .
drwxr-xr-x 16 tnayr staff  544 Apr 20 16:58 ..
After viewing AESCrypt.h, I suspect that the flag encrypts and decrypt with AESCrypt. but we should make no assumption and analyze it with a dissembler and see how do things work. 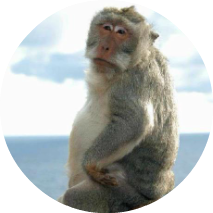 We will first look at the viewDidLoad since it is to load functions and checks before the view controller and a common place to implement security checks. There are a few things that tingle ma spider sense. Our Objective here is to identify security implementation that can possibly be anti-debugging, anti-jailbreak, memory integrity, application integrity and so on. I have identified that anti-debugging, anti-jailbreak were implemented. It is using ptrace system call to prevent process from being traced. It is using sysctl call to detect whether if the process is being debugged. Now onto jailbreak protection, it is obvious that it uses a list of file to determine if the phone is jailbroken. When I try to submit the flag on the app, there will be a jailbreak alert which again verified our observation about jailbreak protection. Now how are we going to test if there is actually debugging protection? We are going to use lldb and there is a fantastic write up on how to set up debugging on ios. link link After setting the environment up, let's see what happen if we try to attach a debugger onto the process. $debugserver *:6666 -x backboard "/var/mobile/Containers/Bundle/Application/C5DC5006-8D20-4C88-BE41-E44B570A49B0/UnCrackable Level 2.app/UnCrackable Level 2"
2017-04-20 21:24:53.456 UnCrackable Level 2[2548:131476] === SSL Kill Switch 2: Preference set to 0. 2017-04-20 21:24:53.457 UnCrackable Level 2[2548:131476] === SSL Kill Switch 2: Subtrate hook disabled. Aha!!! Exit status 45 and that may suggest that ptrace was used to prevent debugging which was identified earlier on our static analysis. We can easily bypass ptrace method by modifying the request argument that is passed into the ptrace function. If ptrace is set to 31 - PT_DENY_ATTACH as shows as the list below will deny any traces made to the process. We identified earlier that ptrace functions is set to 31 which is PT_DENY_ATTACH and we can bypass it by replacing the request argument from 31 to -1. We will write a tweaks to hook the functions. I used xcon to bypass jailbreak protection and they have precompiled list of files that uses to detect jailbreak devices. If you have combined both tweaks and have xcon running, you should be able to attach a debugger to the process and no longer see the jailbreak alert. As we have mentioned earlier, the flag is encrypted and can be decrypted with AESCrypt. So let's hook the function and have it log the cleartext password. P.S: I also found out that there is no memory integrity check, so you can hook the AESCrypt function without bypass any security implementation. I will try to write up on how to prevent the bypass method hopefully next week if i have some time.